This FREE activity enables Middle School and High School students to develop both their analytic and creative skills. Next, they write examples of Specific Characters, General Objects, Specific Objects, Adjectives, Abstract Nouns and Setting on 3′ x5′ pieces of construction paper color-coded to match the topics. Finally, they select the basic bones of their story from the cards the class made in the prior segment of this activity and then they write either an individual story or a collaborative piece in groups of three. Whichever writing idea teachers don’t select can be used for another lesson at a later date. This idea will jump-start their thinking Writing: Start Strong! 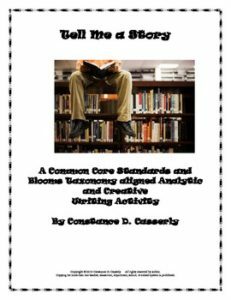 This Common Core and Bloom’s Taxonomy aligned activity offers students a chance to analyze fiction for specific criteria, and to exhibit how they can combine these criteria with the elements of literature to create a durable story that SHOWS instead of TELLS. Using a class-created Strong Fiction criteria list, students analyze writing for the qualities they chose as the most important, and then they create their own stories. Students love to tell stories. Let them do this in writing where they can combine their creative ideas with their growing writing and thinking skills. Writing Activity: Write Right-Great Beginnings!